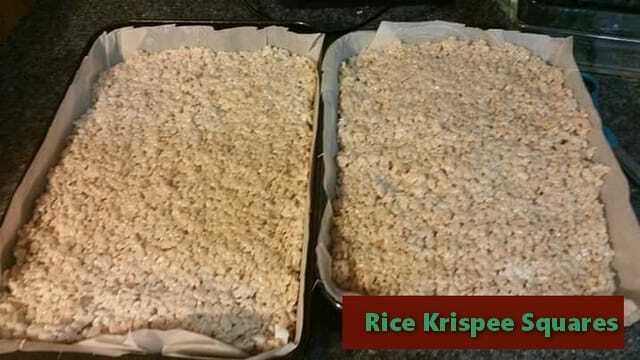 Everyone knows how to make rice krispee squares, especially if you have kids and grandkids!! These were/are a staple in our house. Here is my recipe, and a few ways to make them festive. I use my dutch oven for this. Melt the marg or butter in a large, heavy pot. Add the marshmallows and melt over low heat , stirring constantly until melted. Add the cereal and stir until well coated. Press into a well buttered 8x8 inch pan. Let stand a few hours before cutting. I line the pan with waxed paper or parchment paper to make it easier to remove from pan for cutting into squares. Use the Christmassy rice cereal that have red and green rice krisps mixed in to add some cheer. You can add red and green M&Ms to make these more festive. Melt 1 cup of semi-sweet chocolate chips and spread over top.